MMT launches its new high-tech marvel, the E-Strap, and offers product OEM to watch manufacturers. E-Strap is a patented smart buckle and strap that fits on any analog watch. Hence our slogan: Make Any Analog Watch Smart. Built by the watch industry experts that created the Horological Smartwatch, the E-Strap is a logical next step to add smart functionality to existing analog watches. The ultra-small buckle extension can hardly be seen, as it is thin and covered by the leather strap. Make no mistake however, the E-Strap is built on the full MMT Smartwatch Platform and has its sophisticated functionality. The MMT Platform is the only proven and tested solution with +70’000 modules sold. 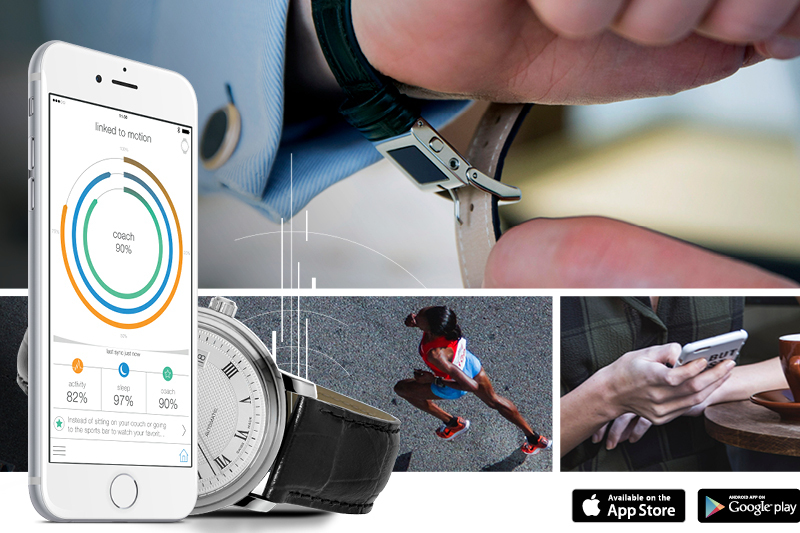 The same MMT-365 Apps that accompany Horological Smartwatches is available to the watchmakers’ E-Strap customers. E-Straps track ACTIVITY with GET ACTIVE ALERTS as well as MONITOR SLEEP with SMART SLEEP ALARMS. Most importantly, E-Straps will be available from selected watchmakers for US$ 199-249, which includes beautiful leather straps in a variety of materials and colors. Since the introduction of the Horological Smartwatch in 2015, MMT has been gaining real world customer feedback on smartwatch functions. Our customers have told us that the primary smart features they desire are fitness and health based. We can see other smartwatch manufacturers starting to see that ACTIVITY and SLEEP are the killer apps of smart sensors worn on the body. Such sensors only measure accurately when close to the wearer’s body. At the same time, we have had plenty of people telling us they hate the silicon fitness bands. Especially Europeans refuse these fitness bands as they consider them ugly and unfashionable. People do not want to be seen with them. Neither do they want to replace their luxury watches with plastic or otherwise less luxurious smartwatches. So, what to do with all these requests to add smart features to existing analog watches? Enter the E-Strap. Straps determine the look and feel of a person’s analog timepiece. Brands offer a variety of leathers and finishes. Typically, watch straps last one to two years if regularly worn. After a watch strap has aged due to wear & tear it needs to be replaced. Then, watchmakers can offer replacement strap that is Smart, enabling a whole new experience for the user. A beautiful strap and buckle combination connected to the MMT-365 smartphone apps tracking Activity and monitoring Sleep with all accompanying alerts, alarms and dynamic coaching. Sleep Monitoring: Wear the E-Strap at night or put it under the pillow to record the sleep pattern. A sleep tracking function provides details on how much time you spent in deep sleep, light sleep, or awake. Cloud back-up and restore: Recover all of your data, even if you lose your E-Strap or phone. The E-Strap independently stores your activity and sleep for 30 days without having to synchronize it to your smartphone. A great way to collect and keep your data on-the-go! Manufacture Modules Technologies Sarl. is the Swiss company established in Geneva in 2015 for the development and commercialization of Horological Smartwatch modules, firmware, apps and cloud. MMT offers a tightly integrated End-to-End Solution for Horological Smartwatches: Firmware, iOS and Android Apps, Cloud, OTA, Manufacturing and Service Applications. MMT modules have been implemented by brands such as Frederique Constant, Movado, Mondaine, Ferragamo and Alpina. The company has a production of over 70’000 modules. For more MMT information, please contact Karim Jaber, Manufacture Modules Technologies Sarl., Chemin du Pré-Fleuri 5, 1128 Plan-les-Ouates, Geneva. Tel: +41 22 884 1490. E-mail: [email protected]. We will be happy to introduce you to our products and answer your questions.